How to Make a Multipurpose Liquid Castile Soap: Dr. Bronner's Copycat Recipe - Oh, The Things We'll Make! Dr. Bronner's soap is a versatile, all purpose cleaner that is a great addition to any household. But let's face it, it's can be quite expensive. 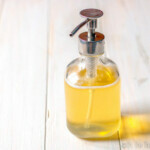 Learn how to make a multipurpose liquid Castile soap at home. It's easy, frugal, and very rewarding. If you've been following my blog for awhile, you know by now that I love making soap. Making bars of soap is a lot of fun, and you can experiment with all sorts of ingredients, colors, and other additives to customize your soap exactly as you like. If you've never made a bar soap before, take a look at my easy, beginner soap recipe, which shows you exactly how to start making bar soaps and also gives you ideas for customizing the soap to suit your needs. That beginner soap recipe is a modified Castile soap recipe, just like this one. I call this recipe a modified liquid castile soap recipe because it uses a variety of vegetable oils. Pure Castile soap normally refers to a soap made with only olive oil. Over the years, the definition of “Castile soap” has been extended to include other soaps made with not only olive oil, but that also add in other vegetable oils. Other vegetable oils are added to change the properties of the soap, normally to give it more lather and make it more cleansing. While it is fun to make bar soaps, I find it more rewarding to make liquid soaps at home. 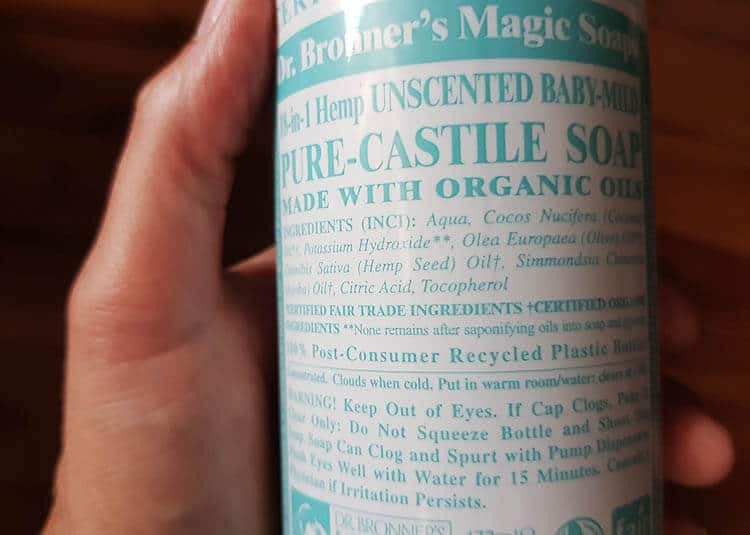 What's in Dr. Bronner's Liquid Castile Soap? I chose to try to make a soap similar to the Dr. Bronner's 18-in-one Hemp Baby Unscented Pure Castile Soap. One of the reasons I chose that particular soap is that it is unscented, and it allows for me to see if my homemade liquid Castile soap has a similar natural scent. (I've noticed that my homemade liquid coconut oil soap and my homemade pure liquid Castile soap don't have the same scent. Both have a mild natural soap scent, but my coconut oil soap smells a lot more like the Dr. Bronner's soap than my soap made with olive oil. Interestingly enough, I'm seeing that the version sold on Amazon in the US appears to be different from the bottle I bought at a local shop here in Spain. Here in Spain palm kernel oil wasn't listed at all, but in the US it is the oil that is used in the highest concentration after the coconut oil. When I made my copycat liquid Castile soap, I didn't use palm kernel oil because I was trying to copy the bottle of soap that I had at home. I had no idea that they made different formulations of their soap here in Europe. My bottle of Dr. Bronner's soap doesn't include palm kernel oil in the ingredient list. I tried to make my recipe as similar to theirs as possible, so I used coconut oil as the base oil for my liquid Castile soap recipe, and used the other oils in descending order, using a smaller amount of those oils than the potassium hydroxide just like theirs. Tocopherol is a form of vitamin E. It is often added to soaps to help extend the life of the soaps as it can help keep any excess oils from going rancid. In the case of liquid soaps that aren't normally superfatted, it probably doesn't help as much in this way, but it still may somehow help extend the shelf life somewhat. (Keep in mind that while the antioxidant properties of vitamin E can help extend an oil's shelf life, Vitamin E is NOT a preservative, and won't prevent bacterial or mold growth.) Still, vitamin E is a nice addition to any beauty product that will be used on face and body as it helps add moisture and can help soothe skin. You can most definitely add a few drops of vitamin E to your homemade liquid soap when you dilute it to help gain some of its positive benefits when using your liquid soap. When I first started making liquid Castile soap, I made the pure Castile soap with only olive oil as often as I made a liquid soap using coconut oil. I figured that for face and body use, the pure liquid Castile soap would be a lot better to use because soaps made with olive oil are milder and more conditioning than soaps made with coconut oil. I wanted versatility, though, so I was making batches of both types of liquid soap to later combine them dependent on each paticular use. The nice thing about liquid soaps is that you can combine the soaps after having made them. I used a mixture of different liquid soaps, using mostly olive oil soap for general bathing and mostly coconut oil for cleaning around the house. Since then, though, I've found that I use my homemade liquid soap made with coconut oil much more than I use the liquid Castile soap made with only olive oil. I even occasionally use it 100% in the shower, and don't find it to be drying on the skin. I think part of that may have to do with me using the glycerin method of liquid soap making. I use glycerin as part of the water component of the soap. I do it to help make an easier to use soap, but I think the extra glycerin (all soaps have glycerin in them that is made during the soap making process) likely helps prevent drying and makes a more conditioning soap. Despite its popularity here on the blog (more than twice as many people check out the olive oil liquid castile soap recipe over the coconut oil liquid soap), I have to admit that I rarely make that recipe anymore. I find myself often making double batches of the liquid coconut oil soap, though. I think people are so used to seeing “liquid Castile soap” for sale, and assume that the olive oil soap, being called “Castile soap,” will be closest to what they would normally buy. That's part of the reason that I decided to come up with another recipe that would be a nice, versatile, all purpose cleanser like Dr. Bronner's liquid Castile soap. This new recipe would combine coconut oil and olive oil, along with a couple of other oils, to make one batch of all purpose liquid Castile soap. Some people had no desire to make two different batches of liquid soap, and I totally understand! 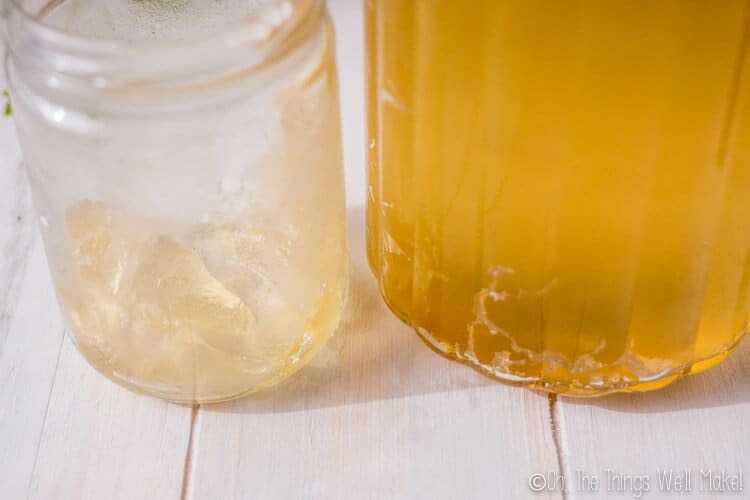 Don't get me wrong; either of the other recipes is pretty multi-purpose as well, but this one allows you to make just one batch and use it for pretty much anywhere you'd want to use liquid soap. How does this homemade soap compare to Dr. Bronner's Unscented Baby Mild Liquid Castile soap? Seeing as how hemp oil and jojoba oils are the more expensive oils in those recipe, that would make a lot of sense. To save even more money, you could definitely reduce those oils in this recipe, but you'd have to run the new formula through a lye calculator first to make sure that you use the right amount of potassium hydroxide. When formulating liquid soap recipes, I usually use the Summer Bee Meadow lye calculator, as I've often read that it's the best calculator for liquid soap making. Not only does it take into account the water compnent in KOH vs. NaOH, but it also allows for calculating in glycerin and alcohol should you choose to use them. My diluted soap is slightly lighter in color than my bottle of Dr. Bronner's. Dr. Bronner's soap is closer in color to my liquid soap paste. That likely means that their soap is a bit more concentrated than the soap I diluted to use as a hand soap. That makes sense when you consider that Dr. Bronner's soap is marketed as being very concentrated, and most people dilute it further before using it. If I were to dilute my liquid soap paste with less water, I'd likely be able to make a liquid soap of the same color as theirs. I would like to say that I've also had the bottle of Dr. Bronner's soap for longer than my homemade liquid Castile soap. I've found that my liquid soap pastes tend to get slightly darker with time, so that could be another factor that affects the difference in color. When using them, both soaps lather up nicely, and neither is drying on the skin. I don't really notice any differences while using them. Why use Glycerin to this liquid Castile soap recipe (When Dr. Bronner's doesn't list it)? Adding glycerin does add to the cost of making your own liquid Castile soap, but it does have several added benefits. When I first started developing liquid soap recipes, I remember reading about people who replaced all of the water in the recipe with glycerin. The idea was that it makes the process more fool proof and speeds up the process of making a clear liquid soap. I wanted to make the process of making liquid soap at home the easiest I could, so I chose to substitute part of the water component for glycerin. I've found that not only does it help move the process along quickly, converting the soap quickly into a liquid soap paste, but it also seems to make a very nice, mild liquid soap, even when only using coconut oil. When you take into consideration that liquid soaps aren't normally superfatted, that's saying a lot. When making a homemade glycerin bar soap, I learned how glycerin can be a solvent of sorts that helps make a more transparent soap. My guess is that the addition of glycerin to my liquid soap helps to make it a bit more transparent even when I don't use excess lye in the recipe. I also think that the addition of glycerin helps make a liquid soap paste that easily dissolves in water. I've read horror stories from people who have a difficult time trying to dilute their soap paste in water. On the other hand, I've always easily dissolved mine just by adding some water to it and leaving it alone for a few hours. Superfatting is the process of adding more oils to a soap than what are needed to react with all of the lye used. The idea is that not only will all of the lye be safely converted into soap, but that leftover oils also remain in the soap to help leave the skin conditioned and soft. You'll notice that Dr. Bronner's liquid soap lists citric acid as one of the ingredients. My best guess is that they are using the citric acid to help neutralize their soap so that the pH isn't too high and doesn't irritate your skin, all while allowing for a nice, clear, transparent soap. If you do end up with some unreacted lye, as long as it isn't enough to bring the pH high enough so that it irritates the skin, it shouldn't be a problem. If you find the soap irritating to your skin, though, you can check the pH and try neutralizing the soap. Up until now, I've never had an issue with any of my homemade liquid soaps using the recipes I've shared with you. When I originally posted this recipe, I used larger quantities of the hemp and jojoba oils. Not only does this make the recipe more expensive to make, but I also found that it made for a cloudier soap. I had a reader comment to me that she had made all of my liquid soap recipes, and that while the others were crystal clear, this one stayed cloudy for her. Mine was cloudy at first, but then an opaque layer settled out and fell to the bottom of the jar. Neither of us found it to affect the quality of the soap, but I didn't really find it to improve the soap either. I decided to give you an updated version of the soap, with reduced quantities of the more expensive oils. I've found this updated version to stay nice and clear, and I think it behaves similarly to the soap I bought in the store. Dr. Bronner's soap is a great all-purpose cleaner, but it can be quite expensive. 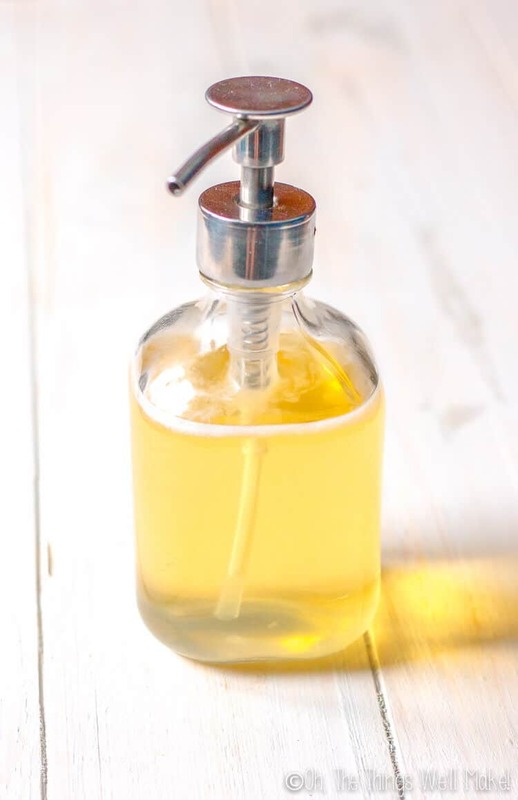 Learn how easy and rewarding it is to make your own liquid Castile soap at home. Weigh out all of the oils and add them to a slow cooker on low heat. Weigh out and mix together the distilled water and glycerin. Dissolve the Potassium hydroxide (KOH) in the distilled water and glycerin mixture in a well ventilated area. Add the KOH to the water and not the other way around. Use gloves and safety goggles when working with potassium hydroxide. the mixture will heat up and get hot. Avoid inhaling the fumes. Add the potassium hydroxide solution to the oils in the slow cooker and begin to slowly mix them together. Use an immersion blender to blend the oils and potassium hydroxide solution together. At first it will get opaque and thicken slightly, then it will look curdled. Keep blending! Continue blending until it gets more opaque and begins to get too thick to blend with the immersion blender. I stopped blending as soon as I felt too much resistance so as not to burn out the blender, and my soap paste turned more solid almost immediately after I stopped. Continue to heat the paste, stirring as best you can with a spatula or spoon every half an hour or so. You want to continue to cook the soap paste until it becomes translucent. A good way to check what your final soap should look like is to dissolve a small amount in some distilled water and see if it dissolves clear. If not, continue to process a little longer. You'll probably end up cooking the paste for a few hours. Once processed, you can store the soap paste in glass jars in a cool, dark place until you are ready to dilute it to make your liquid Castile soap. Depending upon how concentrated you want your soap, dissolve the soap paste in distilled water. I usually use somewhere between 2-4 parts water for every 1 part of soap paste. I dissolve small amounts at a time and leave the rest as a soap paste until I need to use it. The soap paste will keep for longer than diluted liquid soap. You can now add in any essential oils that you want to use to add a fragrance to your soap, or you can keep in unscented. You can also add in a few drops of tocopherol (vitamin E) at this time. Enjoy using your homemade liquid Castile soap. This recipe makes 4-4.5 lbs. of soap paste which can be diluted to 10-20 lbs. of liquid soap, or 1-2 gallons, depending on your dilution rate. Keep in mind that liquid soap is not as thick as commercial gels and surfactants. You'll find that this soap, like Dr. Bronner's, doesn't need to look thick to be a concentrated, effective cleanser. Find more information about diluting your liquid soap paste here. Read more about checking the pH and neutralizing liquid soap here. This copycat recipe of Dr. Bronner's Unscented Baby- Mild liquid Castile soap uses larger quantities of hemp and jojoba oils. I have found that they contribute to a cloudier soap. After settling, this soap may form an opaque layer that settles out. It doesn't affect the usefulness of the soap but may make it less aesthetically pleasing. Don't want to use hemp and jojoba oils at all? Some people have been asking me for a soap without hemp and jojoba, so I decided to calculate it out for you. I haven't personally tried this recipe myself yet, but I imagine it would make a wonderful soap. This version of liquid soap uses only coconut oil & olive oil, making for a simpler, less expensive soap recipe. This recipe makes around 5.5 lbs. of soap paste which can be diluted to 12-25 lbs. of liquid soap, or around 2 gallons, depending on your dilution rate. Are Dr Bronner’s oils refined or unrefined? Thanks. Do you mean if you need to use refined oils to make this recipe? Or if the ones in the actual Dr. Bronner’s soap are? I’m not sure which Dr. Bronner’s uses. For making this soap, though, you can use either. Do I leave the lid on the slow cooker while this is “cooking”? I didn’t see that in the instructions — not sure if it matters or not. Just wanted to make sure. I guess I should go back and clarify that better. Yes, I tend to cover it during the cooking process. I’m not sure that it really matters, but I figure that if too much water evaporates, it will be harder to cook the paste well. It would probably be fine either way. Wow you are so amazing!!! Thank you for all your research and sharing all this good advice!!! I am desperate for a recipe that holds up to Sal Suds without the SLS. Have you found a good copy recipe for sal suds? I’m on a mission to make a great liquid soap and dish soap that foams and cuts grease as well as holding a thicker consistency! I’d love any advice! I am so thankful to find your blog! BUT, I don’t use it for skin care- only for general cleaning around the house. I have my laundry detergent recipe up on the blog and it’s based on that recipe. I think, though, that I may ditch the preservative and bring the pH up with NaOH instead, which I think is what they do. SLS is harsh for skin and hair (I never would use it for personal products either), but otherwise is biodegradable and I feel is safe, and I see no issues with it for cleaning. Is there a specific reason that you are trying to avoid it? Hello. I’ve been making castille soap for quite some time. My castille is liquidy. I haven’t been able to figure out the best natural method for getting it to thicken up to hand soap consistency. Have you ever tired to thicken yours and if so, what methods are you using ? Thank you in advance. I normally dispense mine in foam dispensers, so having it be very liquidy isn’t a problem. I do dispense also in dispensers like the ones shown in the pictures, but normally more for using on sponges to wash dishes, etc. I’m going to attempt to make a medicated version of this . How long can this paste recipe be preserved for before it spoils ? When diluting the paste , how long can it Ben preserves for ? I’m trying to make a small batch medicated cleanser but would like to know how dad tto use it up 🙂 thank you ! This is an amazing recipe I’m excited to try! I’ve had some soap paste that has been sitting around for over a year, and it’s in perfect condition still. It will last a very long time, depending on how and where you store it. As long as you keep it in a cool, dry place, and avoid storing in metal containers, you should be fine. As for the diluted paste, it also keeps for a very long time. I asked a professional cosmetic formulator about liquid soaps once, and she told me that because of the extreme pH of soap (anything with a pH under 4 or over 9 falls into these categories), it should keep without the need for an added preservative for up to a year. Thank you so much for your quick response !!! So i ran your recipe through a lye calculator (Im trying to fully understand everything and learn how to use the calculator) and since vegetable glycerin isnt a oil it usually isnt listed in ingredients right ? The calculator calls for 28.2 oz of water but i noticed you had 20.2 oz of water, Is this because 8 oz goes to the vegetable glycerine ? so its considered a liquid ? Sorry for the previous typos, i was probably breastfeeding with a toddler jumping on me haha. im going to buy jojoba oil tomorrow but would there be another similar oil that can replace this ? I want to ask you if I can add xanthan gum to the liquid soap ? If yes, How is the best way to do it? I make the soap past following your recepie with coco and olive oil. I feel my hands s little dry after use it (I live in a very dry place), can I add more oil to the paste wenn I dilute it with wather? Need a emulsifer for that ? Some idea for me? love your site ! Thanks! I haven’t added xanthan to liquid soap yet. I have added it to other surfactants, though, and I’d imagine that you’d do it in the same way. I know some people do add some oils to the soap afterward. I’ve actually never tried it. My guess is that you should be able to incorporate a small amount without needing an emulsifier. I think the nature of liquid soap would allow for that, but I’m not sure. I’d have to experiment. Adding oils should make the mixture cloudy, though. Keep that in mind if you are looking for a nice, clear, transparent soap. If that’s not a problem, then go for it. Thank you for the recipe. How do I know which recipe to follow for baby wash? Keep in mind that the pH of any soap is a bit on the high side which may be a bit on the harsher side. I personally didn’t use much of anything when washing my son’s skin when he was a baby and kept the soaps and cleansers for using only on dirty areas. I will be sharing a recipe for a mild baby cleanser using surfactants very soon! Surfactants aren’t quite as “natural” as soap, but their pH can be modified more to bring it into a more neutral or acidic range, which is more compatible with our skin. There are mild, more natural surfactants on the market these days that we can use for that sort of thing. Would it be possible to add a little essential oils for scent to this recipe? scents like rosemary, lavender, eucalyptus, mint, etc. In the video the coconut oil is liquid. Is it just heated up? Or is it fractionated coconut oil that is used? Yes, the oils are heated in the slow cooker before adding in the lye solution. Don’t use fractionated coconut oil as it needs a different amount of lye! I was looking at your updated Dr. Bronner’s baby mild formulation. Would it be at all possible to swop the coconut oil and olive oil ratios to create a even milder soap but with a little bit of lather? To be honest, I wouldn’t bother. It’s interesting because when you make a bar soap there is a HUGE difference between a soap made with olive oil and one made with coconut oil. On the other hand, with a liquid soap, I just haven’t found there to be that big of a difference. I made batches of both and after years of using them, I’ve come to the conclusion that it just isn’t worth it to make both and mix them. A recipe like this one is good, because it allows you to have some of the properties of both oils, but I have to admit that I mostly make only the coconut oil liquid soap these days. It’s the cheapest for me to make, and I like the light color. That’s really the main difference I see! I was expecting so much of a difference because there in bar soaps, they make such different type soaps, but with liquid soaps, I just haven’t found it to be the case. Oh- and looking back at your comment- I’ve found that both also lather quite well in liquid soaps. I was wondering how long this needs to sit/cure before it can be diluted? There is no need to let it sit or cure before diluting. It can be used immediately! I meant my paste (not trace)…. 1. My trace became clear, but when I do the tast with water, its still milky – what to do? 2. In the end you dissolved it with lots of water, and water brings bacteria, how can it be that it is not necessary to put preservative? 1) I’d actually just transfer it to storage jars to wait and see. In some cases it will behave that way at first and just happens to clear up on its own. I haven’t personally had it happen, but others have had that happen and have told me about it. I did do an experiment with only partially cooking the paste, and when I stored it away, it finished the process on its own without cooking within a matter of a few weeks. It’s quicker to cook it, of course, but I have seen that it does continue to do its thing once you’ve stopped cooking. 2) Liquid soap is self-preserving because of its high pH. Anything with an extreme pH is unfriendly to bacteria. I spoke with a professional cosmetic developer who assured me that most products, including liquid soap, (unless you add difficult to preserve ingredients like coconut milk or food/plant matter), that have a pH under 4 or over 9 will be self-preserving for up to a year. So, I’d still use distilled water to dilute your soap and try to use it up within several months once you’ve diluted it (I’ve stored the paste longer. ), but you don’t really need a preservative! first – Congratulations for your son birthday! When you say the paste is separate- what, exactly, do you mean? Do you mean it isn’t staying together as a paste and is separating somehow? You could send to [email protected] if you’re able to do so. No the paste didn’t separate. I mean that for the test I took only 1 spoon from the paste and mixed with water. Can babassu oil be substituted for coconut oil in the recipe for liquid Castile soap? I’ve never tried making a liquid soap with babassu oil, so I’m not sure what the resulting soap would be like. Oils behave differently in soap, so it’s hard to know how substitutions will turn out. In any case, you’d have to run it through a lye calculator because each type of oil needs a different amount of lye. Hello Tracy! Thank you so much for sharing your recipes, as well as the wealth of information for newbie soapers like myself. My question is: If I were to re-size the recipe, what are the percentages for each oil (I’m using the simple recipe with just CO and OO)? And how do you determine the amount of glycerine from the water? I’ve been trying to figure it out through soapcalc but am stumped 🙁 Help! You’re very welcome! I’m happy to share whatever I learn! I use the sbmcrafters advanced soap calculator when I make liquid soaps because that one is supposed to be the most accurate for liquid soap, and it allows for adding glycerin. You can really use any percentage of glycerin you like. Some people replace all of the water with glycerin. I don’t feel that is necessary and I also hear it can make the resulting paste less stable. In any case, to resize any of my recipes, just hover over the “serving size” and a slider will come up. It will allow you to increase or decrease the amounts of the entire recipe! 1. Can you use a gas stove top successfully rather than a crock pot? 2. I think you said you could expect a shelf life of a year. How much do you make at a time of the coconut oil and the coconut oil / olive oil? 3. I think the KOH has a shelf life of a year. How much do you buy at a time? 4. Have you ever experimented with shea butter? 1. Yes, you can use a stove top, but you’ll have to take a lot more care in making sure that the soap paste doesn’t burn. You want a very low heat source. (Some people bake the paste at a low temperature in the oven, so that’s another option!) If you feel it’s burning at the bottom, you could try heating it over a makeshift double boiler. (You’ll need something big enough for all of the soap paste.) You’ll need to keep a closer eye on it, and may need to stir more often to prevent overcooking on the bottom layer, but it should work. 2. It may have a longer shelf life- and when I say that, I’m referring to the actual liquid soap that has already been diluted. I make this actual batch amount and it gives a lot of soap paste that you later dilute in distilled water as needed. The undiluted soap paste keeps quite well, I may still have some from different batches of liquid soaps from years ago and they still look great. (I’m constantly experimenting with these sorts of things.) The year is a guideline for how long a product like this with a high pH and with water will keep without adding preservatives. I hope that makes sense! 4. No, I haven’t used shea butter in liquid soap. (Yes, I do use it in many other homemade products.) I have been meaning to try using more of the butters in bar soap making, though. I’m finding that the best oils for liquid soap are coconut oil and olive oil. Castor oil is also supposed to be decent in liquid soap making (and glycerin soaps). I’m finding so many of the other oils just cloud up the liquid soap. I think with liquid soaps, simple is best! Don’t overthink it too much! I’m just starting to make soap .I appreciate your article hope to do good work through your advice and guidance. You’re very welcome, Dalal! I’m happy to help! Tracy, thank you so much for this recipe! It’s exactly what I was looking for. I have a question though. The recipe says this makes 1-2 gallons of finished liquid soap. Is that the dilution that would be similar to Dr Bronner’s concentration? And that it would then be diluted further for the various ways that castile soap is used, laundry, washing dishes, facial soap, etc.? Yes, that dilution would be for a similar dilution to theirs. Notice the very broad range, just because it’s impossible to really know their dilution rate. You are making a somewhat solid paste that is sort of like a putty. When you dilute, it is still very concentrated, even though it will appear on the liquidy side, but if you’ve used Dr. Bronner’s soap, you know that theirs is the same way. hello, very interestin!!! i was wondering if filtered Brita water would be ok? is distilled water suggested because it needs to be chlorine free or for the need to have all possible bacterias killed in the evaporation and recondensation process? Normally that will be OK for making soap and diluting it. There are several reasons I suggest using distilled most of the time. Many people have hard water or water with minerals that may react strangely when making soap. I want to avoid people having problems due to the quality of their water. If they have problems making soap, I like keeping the potential problems to a minimum. If you use distilled water, I can rule out an issue with the water as one of the possible problems. The other issue is, yes, microbial contamination does concern me. When you use distilled water, you are more likely to end up with a product that won’t be contaminated with bacteria later on. Soap is one of the rare products that you can make with water that doesn’t really need a preservative because of its high pH. That said, you still want to try to avoid any unwanted microbes to begin with because it is still possible for some bacteria to grow in extreme pH’s. 1. what is approx shelf life after I dilute in water to make face wash? 2. At which stage should I add essential oils? Once you dilute in water, you should be fine for several months, at the very least. I consulted with a cosmetic developer and asked about needing preservatives in liquid soaps. Her response was that liquid soaps don’t normally need them because the pH of soap is generally high enough that microbes don’t easily grow in it. She said that products with a pH of lower than 4 or higher than 9 can normally keep for up to a year without a preservative. I haven’t specifically checked the pH on this particular soap (Perhaps I should) as I normally only dilute a small amount at a time and use it up within a couple of months. I wouldn’t worry too much about it, though. If you do see any weird changes in the appearance of the soap after some time (I personally have never had that happen with my homemade soaps), you should consider throwing it out and diluting more. I add the essential oils when I add the water to dilute the soap. The nice thing about adding them at the same time as you dilute it is that you can experiment with using different oils each time. Just finished this recipe, followed it to a T. It’s really good!! It’s not drying despite being over 50% Coconut Oil. I’m excited right now! I think I’m in liquid soap love!! LOL. Thank You TRACY! I’m so happy to hear that, Reyna! Did you make the updated version or the older one? I had another reader tell me the same thing happened to her with the first recipe, which is why I gave the updated one. We decided that we didn’t think there was really any benefit to adding more of the other oils, and if anything, it made a less aesthetic soap. Another thing that can make the soap become cloudy is if there are too many oils in the recipe. If you are sure that you used the exact amount listed, though, that shouldn’t be your problem. In any case, do know that it will not affect the way the soap works. It will still work in the same way, but, of course, it doesn’t look as nice in a transparent soap dispenser. When I get soaps (from experimenting) that don’t turn out transparent, I usually end up either using them in opaque (ceramic or stainless steel) soap dispensers or use them for general cleaning around the house. One last question– did you use distilled water? Hard water can definitely affect your soap! I’m sure it’s just fine. Hopefully one of the others will turn out clearer for you! Also, typically I like to keep things seperate but is it safe to use a crockpot I cook in to try out this recipe? To try, not for regular use in my liquid soap making adventures. I really hate asking this, but before I invest in a new or previously-loved crockpot or even searching my mom’s collection of kitchen treasures, I want to make sure I will be putting it to good use. What do you think? I will most likely try it out once or twice (if it’s safe to do so) before investing in one specifically for this, but I want to make sure it is safe to do so. It’s better to be safe than sorry. Please don’t be sorry because that it is a great question! I’m not going to criticize that choice because I use the same materials for soap making as I do for cooking. I’ve never understood why some people feel that it is important to use different materials for each. I think it’s all based on a misunderstanding about what lye really is. While it is important to be very careful with lye, we should also understand that the reason is that it is very alkaline. So, it is caustic and can burn you just like something very acidic can. It can also give off fumes that can hurt you if you breathe them in. On the other hand, lye solutions are used in food preparation. Olives are often cured in lye. Pretzels and bagels are often bathed in a lye solution to give them their characteristic crust. Thank You. I appreciate your speedy reply. I just wanted to make sure. Even though I know that the lye is used up in the saponification process, I am pretty new to soap making and wanted to make sure. I’ve just always kept things separate in my candle making hobby and although soap making is completely different it’s just out of habit. Lol. Again, thanks so much. Hi Tracy! I have a quick question. Are the oils weighed in fluid oz? or just oz? Asking because my scale has fluid ounces and ounces. Thanks! You can’t make Castile soap, or any soap, without some sort of lye. Normally NaOH is used in bar soaps and KOH in liquid soaps. Thank you very much for your quick reply. I really look forward to your post on coco glucoside soon. The reason why I am asking is because I am having a baby soon in 3.5 months time and hope to make a baby wash gel for my baby. What are your thoughts and what do you think? Is this something that will work for my baby without any allergic reaction? To be honest, that recipe doesn’t look safe to me! It appears that they tried to use glycerin as a base to avoid needing to use preservatives, but with the water in the surfactant itself, you need a preservative. You can use natural ones. If bacteria and/or mold start growing in the product, you may not even know it. You can usually see mold, but not bacteria. I’ve seen pictures of rashes of people who have used a product that wasn’t properly preserved. It isn’t pretty, and I wouldn’t wish it on a baby! The reason you don’t need a preservative with liquid soap is that of its high pH. In any case, such a huge percentage of glycerin would make for a very sticky product. I’d replace it with distilled water or some gentle hydrosol or floral water and then use a safe preservative. I wouldn’t use glycerin as more than 5% of any recipe. Really appreciate the advice that you’ve given me. The main difference is in the type of lye used. Liquid soaps use potassium hydroxide (KOH) while solid bars of soap use sodium hydroxide (NaOH). Hey Tracy, im planning to attempt liquid soap this weekend. I understand glycerine helps speed up the process and can also provide more a moisturizing quality. If i choose to omit the glycerine do you have any suggestions of things i should consider? Are your recipes supperfatted? If no, should i supperfat when omitting the glycerine? Finally are cold process and liquid soap recipes interchangeable with just switching the type of lye? If you want a transparent soap, you definitely don’t want to superfat it. If you don’t care about that, then you can slightly superfat the liquid soap, but you’ll end up with something cloudy. To make things easier, I neither lye excess nor do I superfat. I calculate my liquid soaps to be exact. I’ve tried with different brands of KOH and so far I’ve always been pretty successful with getting a nice, pretty soap. I probably wouldn’t bother using anything else if you omit the glycerin. I’d just switch it out for water. As for switching out the recipes- to be honest, I’ve never tried seeing what would happen with the same amount of NaOH. I always run each individual recipe through the lye calculators, so I’m not sure. May I know if there is a difference in using unrefined jojoba oil and refined jojoba oil? and whether to use a cosmetic grade jojoba oil? thanks so much once again.. I think these things make more of a difference when making things like lotions where the oils stay intact. With soaps, though, the fats are converted so it doesn’t really affect things in the same way. You don’t really end up with the same properties of the oils in soap as you do before the saponification process, so it’s hard to really know how the fats will behave once you use them to make soap. Thank you so much for replying both of my questions. And may i just add one last question? Are these soap safe for babies? Cause i want to use these handmade soap for my newborn.. Yes, you can use the soaps for babies, but I would like to say that in general, you should be very conservative in the amount of soap you use on the skin, especially with babies. (This isn’t really a comment about soap only, but really any sort of surfactant or cleanser). This really goes for anybody, but is especially true for anybody with sensitive skin. We all react differently to different products, though, so if you feel like it’s irritating your baby’s skin, perhaps it would be best to try with something else. So, many liquid soap makers will make their soaps with an excess amount of lye and then they use either citric acid or borax to bring the pH back down a little. You can add some citric acid, if you like, but too much will make the soap fall apart. Soap can never really be in the neutral ph range. It is always a bit alkaline, so you have to be careful when adding it. To understand the whole issue better, you could read my post about neutralizing liquid soaps. Thank you for all this great information! This is a well written and detailed post for a beginner like myself. I’d like to know if I can still use these recipes if I’m using the cold process of soap making. Thanks much! I pretty much always cold process all bar soaps, but liquid soaps are a bit different. I will say that I have done some experimentation with cold processing liquid soaps (which nobody seems to do), and am about to post my findings so far. Maybe I can put it on my schedule for this week, and try to write about my experience! Yes, there is little information to be found on cold process liquid soap! I’d love if you posted! Hi Tracy, I am Newton from Brazil. I have produced successfully soap bars of Pure Castile Oil according to your recipe and they are great. Now I am trying to produce the liquid soap but would like to use the pure NaOH I have from the bar recipe. Is it possible? I know that KOH is harder to find and normally more expensive, but I think it’s totally worth it. Making your own liquid soap is probably one of the most rewarding hobbies you can have. It makes a lot of liquid soap, and in the end saves you a lot of money! Crystal clear response. Thank you Tracy. Hello! I was wondering if this liquid soap can be used for everything the Dr. Bronner’s one says (the 18-in-1 idea) and how long does a batch lasts. I’ve been trying to find a soap that I can use for cleaning, laundry, etc. I think of their list as more of a list of ideas of things you could try. Ha! i dont have hemp oil. can i just add more olive and coconut oils? I was just about to update this post anyway, as I had recently been trying out a new version of this recipe with smaller amounts of jojoba and hemp oils. I found that too much of those oils made for a cloudier soap. It didn’t affect the quality of the soap but did affect the aesthetics. I decided to not only add in my new version but to calculate and add a final option for a multipurpose liquid Castile soap that uses only coconut and olive oils. It’s now the 3rd recipe listed in this post. I want to do a castile soap shampoo and use it with your conditioner. Do you have or know any good recipe? I found so hard to make shampoo. I was considering having somebody do a guest post on my blog for how to do a shampoo or a shampoo bar using soap from somebody who uses it on their hair successfully. I personally can’t use soap on my hair as it just doesn’t respond well to it. I think there are certain hair types that do adapt to the higher pH of soap, but mine isn’t one of them. That said, I’ve been experimenting with some natural surfactants to make a surfactant based shampoo (more similar to what you would buy, but without the artificial fragrances and some of the other additives that one might want to avoid), and will hopefully be posting one of those relatively soon. I’ve been perfecting a “low shampoo” that’s been working well on my own hair, and then will work on a more “normal” shampoo. and thank you so much for your website. I love it. Thank you for sharing this recipe. Can I replace to almond oil or apricot oil instead of hemp oil? You’d have to run the recipe through a lye calculator first to see how much lye (in this case KOH) would be needed with the new oils. I made a new batch of this soap a week or two ago with less of the expensive oils (hemp and jojoba), and I think I actually like it better. I’m about to post the new recipe. Let me see if I can get working on getting it up as an alternative all-in-one soap recipe on this same post. If you can’t figure out how to work the lye calculator (I use the summer bee one for liquid soaps), maybe I can help you once you let me know which one you prefer trying (the one with less of the extra oils) and which of the oils you’d prefer to try to sub out for the hemp. Could you calculate the amount of KOH with almond oil instead of hemp oil? BTW, I’m looking forward to seeing your new recipe soon. Sorry for the delay. The lye calculator I usually use was down the day I saw your comment. I have now updated the post with 2 new recipes- One that uses smaller quantities of hemp and jojoba oils, and one that doesn’t use them at all. If you were to want to try adding in some almond oil, you could add an ounce of almond oil to the final recipe. (So, 28 oz. coco, 8 oz. Olive oil, 1 oz. Almond oil). You’d then use 9.35 oz of KOH and adjust the water to 20.06 oz. (The glycerin would stay the same at 8oz). I haven’t tried a liquid soap with almond oil, though, so I have no idea how it would affect the final soap. You don’t need to add glycerin to the recipe if you don’t want to add it. I’m only explaining my reasons for adding it to this recipe based on my experimentation. I find that it makes the recipe more foolproof for those who’ve never made liquid soap before, and it makes for an easy-to-dissolve soap paste. If you don’t add it, glycerin is still a by-product of the soap making process so you’ll still end up with glycerin in your final product. So, I guess if you want to completely avoid glycerin based on that article, you should avoid all soaps. They also linked to the EWG database that gives it a good safety rating. Hi Tracy, I am new to your blog and I enjoy very much on what you share. Will keep on following your blog. I am so happy to have found your site! I found that I react to (of all things) citric acid. ☹️ The home-made foaming liquid soap recipe I use calls for liquid Castile soap. I only knew of Dr. Bronner’s, which has citric acid. I made your liquid Castile soap today, and it works great! I have also made your easy beginner soap too. I am hooked, and I can’t wait until my first batch cures. I am so excited to use them! Thanks so much for all of your work—and for sharing it! For general cleaning and most uses, I’d try out the liquid coconut oil soap too. It’s actually my favorite because it’s the most cost efficient one, and I don’t really notice a huge difference when using the different liquid soaps. (I notice a much bigger difference in the different oils in bar soap.) After using this one for awhile, and comparing, I think Dr. Bronner’s uses more coconut oil and less of the other more expensive oils. So I think I’ll be experimenting with a new combination for this one- and will update the post with a 2nd recipe and my thoughts after trying out both for awhile. I had a blood test that revealed food and food additive sensitivities, and I was told that my blood was moderately reacting to citric acid, meaning my blood had created antibodies to the citric acid. It stems from leaky gut syndrome. I am on an elimination diet now, so hopefully it won’t be forever. Funny thing—the only citrus fruit I reacted to was lime. I am happy that it led me to a more economical hobby! I will try out the liquid coconut oil recipe next. Thanks again for sharing your information! Wow- That’s interesting- and sad. I hope you are able to heal things! I can definitely help you make yourself a nice cream without harmful ingredients. Let me know if you’re looking for something specific! Thanks for sharing the cream. It is definitely hard to find things without citric acid in it! I unfortunately also reacted to pineapple, so I’m restricting it for awhile, then I’ll try it again to see what happens. I feel your pain! It’s my first time on your blog. 1) For use as “baby soap”, which ingredient would you add/remove and at what percentage? 2) “Skin whitening soap” is popular in Asia. What is the added ingredient, and at what percentage? 1)For a baby, I might choose my pure liquid Castile soap made with olive oil. Olive oil is a very conditioning oil in soaps. Coconut oil is more drying to the skin. That said, I haven’t noticed as much of a difference in that sense in my liquid soaps as I have in bar soaps. I find all of these soaps to be pretty mild as they are (I think the added glycerin helps quite a bit), but soaps in general have a relatively high pH, and that may be drying to a baby’s skin. There is the possibility to add some citric acid or something to the soap to bring the pH down slightly. You have to be careful not to bring the pH down too far, though, because soap can never really be in the neutral or acidic ranges. It would fall apart. Adding something like citric acid can make the soap start to get cloudy. I have more information about all of this in my post about neutralizing liquid soap. I actually want to update that post soon with some of my more recent thoughts on the subject. I will say that I was using these soaps on my son, who had horrible atopic dermatitis several years back. (He still has skin issues, but they have since improved by quite a bit.) I really only use soaps to clean what is really dirty, though. I think with babies and anybody with sensitive skin especially, that you don’t want to overdo soap or any cleanser for that matter. Only use them when and where you need to. 2) I wasn’t familiar with the skin whitening soaps. They look very interesting. I just looked it up online, and it appears that they are usually bar soaps with ingredients like glutathione, kojic acid, arbutin, and placenta as the active ingredients. I can definitely look into trying to make something like that for the blog. I think it could be sort of a fun experiment, but for now, I’m sorry to say that I don’t know enough about the subject to give you a good recommendation. Hi Tracy, is it hemp oil or hemp seed oil? I am finding it difficult to know which one. I am hoping it is Hemp seed oil because it is cheaper. Yes, hemp seed oil. Here they call it hemp oil, but, yes, it’s the hemp seed oil and not some other extract from other parts of the plant. All of that said, even that oil is relatively expensive. I’ve been considering making a new version of this soap with lesser amounts of the jojoba and hemp and adding it as an alternative to this recipe. Over the last months, I’ve talked with a few other people that have made this recipe, along with the other liquid Castile soap recipes on the blog, and we aren’t sure that we see any real benefit to adding the more expensive oils. Don’t get me wrong, this still makes a great liquid soap, it’s just not necessarily better than the much cheaper coconut oil liquid soap. I think that Dr. Bronner’s soap probably has less of those oils, too, because it smells a lot like the liquid soap made with coconut oil. Another thing we’ve found is that this one, with time, forms a bit of a layer that falls to the bottom of the container. It doesn’t do anything bad, it’s just a cosmetic concern. I guess all of that to say that if you’re concerned about the cost factor, I’d probably make the coconut oil liquid soap. It’s the cheapest to make, and probably my favorite. I use it for multipurpose cleaning, but haven’t found it harsh for using on skin. I make it most of the time, and rarely even make the liquid Castile soap with olive oil anymore because I don’t feel like the coconut one is harsh in any way. I hope that helps. hello, if I want to use this liquid soap as an all-purpose cleaner around my home, how much essential oil should I add to it to make a nice and very fragrant scent? i.e. what percentage of essential oils should be added to 1 ounce of soap for cleaning homes? 3%, 4% 5% or much higher? I read somewhere that the more essential oil you add may not increase the stregth of the scent. There is a tipping point. That’s actually probably true- which is also why I don’t usually measure out the oils for the scent. I just start adding in a few drops at a time and sniff to get to the right concentration. If you’re mostly going to use for cleaning, I’d actually recommend the coconut oil liquid soap. It’s my favorite of the liquid soap, and while you can also use it for body, it’s probably the best one for cleaning. I actually want to update this recipe post with a second recipe for an all purpose with lesser amounts of the more expensive oils. After using this soap for awhile, not only have I found them to make the soap separate a bit giving a more opaque, foamy layer, at least in the winter time, but it just increases the price of the soap unnecessarily in my opinion. I’m pretty sure that they use lesser amounts of those oils than I did- and I’d really like to perfect the recipe to get an inexpensive all purpose soap. Don’t get me wrong. This soap is just fine, but I’ve been talking with a couple of readers who have also tried this soap. We all like it fine, but none of us think that you need to use the more expensive oils in such a high concentration. I won’t be deleting this recipe, but plan to give a new, second recipe here- with the explanation- very soon. I recalculated lye and water with the calculator from the soapcalculator.com web site. The amount of water and lye is different. I use the Summer Bee Meadow lye calculator for my liquid soap recipes because it is supposed to be the most accurate when it comes to liquid soaps. Plus, it allows for the glycerine method of liquid soaps by having that be one of the things you can input into the equation. I often use soapcalc.net for my bar soap recipes. I’m not familiar with the soapcalculator.com. The water amount shouldn’t make much of a difference. You appear to have calculated a bar soap recipe, as I see you have used NaOH and not KOH. Sodium hydroxide will make a bar soap. If you want to make a liquid soap, you need to use potassium hydroxide. Hi, i live in South Africa. Some of the ingredients are very difficult to find and expensive if you do find them. Can I substitute the hemp and jojoba oil with more olive or coconut oil? If I were you, I’d just make either my liquid coconut oil soap or my liquid castile soap with only olive oil. I really want to update this post with my thoughts about these liquid soaps. I formulated this recipe because people wanted an all-in-one liquid soap, but I find that there isn’t really much of a difference between the different homemade liquid soaps. I really think that the oils make a much bigger difference in bar soaps. In the end, I pretty much always make the liquid soap made with only coconut oil. I find that it’s completely multi-purpose, and it’s even very mild in the shower. I don’t find it at all drying on my skin. I think Dr. Bronner’s probably uses even less of those oils than I did, and find their soap to be very much like the coconut oil soap. Maybe I should give an alternative recipe here that only uses coconut oil and olive oil. I’m about to head out the door, but I’ll try to put up a recipe alternative in the next couple of days if you’re interested. Thank you for this recipe. Could it also be used for the basis of washing liquid recipes that call for 1 cup of ‘liquid castle soap’?